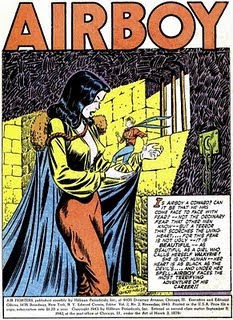 On Pappy's Golden Age Comics Blogzine, I found this 1943 comic book featuring Airboy and Valkyrie. During World War II, Airboy was a comic book boy hero who battled the Axis in his flapping flying machine - "Birdie." His greatest enemy was Valkyrie, a beautiful female Nazi flyer who eventually saw the error of her ways and defected to the Allies. The Golden Age of Comics: when good guys were good guys, and bad guys were gorgeous babes who eventually fell in love with the good guys. BB Cartoon Circus: The Weirdest Cartoon Ever! Rock-Em Sock-Em Robots! From 1933!